The colorful lily-like alstroemeria flowers have distinctive streaks and markings making them attractive additions to landscapes. Provided with preferred growing conditions, the plants will live and even reseed, producing new garden additions. 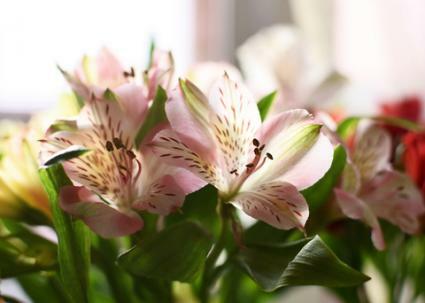 South American natives with over 50 species in the family Alstroemeria spp., several of the more common types of alstroemeria and its hybrids have graced gardens and indoor vases as long-lived cut flowers for years. 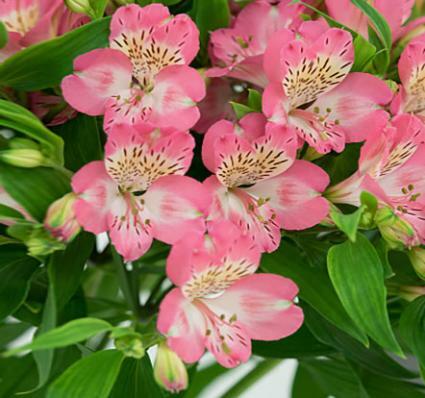 New hybrids are constantly being introduced into the market, with many bred from the Alstroemeria ligtu types. You are most likely to see these hybrids sold as cut flowers in your local supermarket or florist, with flowers ranging in a vast array of colors. Alstroemeria aurea is another colorful type commonly grown in gardens where it will naturalize growing in ideal conditions. Both types are similar in needs and requirements though their growth habits are somewhat different. Flowers and foliage: The fragrant lily-like flowers with streaked and spotted throats range in colors of yellow, pink, red, purple, lavender and white, with a rounded, bunching habit. Depending on the type, the 4-inch long lance-shaped foliage is green to greenish-silver, blue, and gray. Blooms usually appear in July and last for weeks. Size: Plants have a medium growth-rate, reaching up to 2-feet tall and 3-feet wide at maturity. Root system: The plant produces a fleshy and brittle root system that can form large bunches in the landscape. The roots don't take disruption well, so it's best to plant in a permanent location. Flowers and foliage: The lily-like flowers are yellow or orange with spotted and streaked throats, with an upright, bunching growth habit. Lance-shaped, 4-inch long leaves can be green to greenish-silver, depending on type. Blooms appear in June and July and last for weeks. Size: Plants have a medium growth-rate, reaching 3-feet tall and wide at maturity. Root system: The plant has a fleshy and brittle root system that forms large bunches in the landscape. The roots do not like to be disturbed, so it's best to plant in a permanent location. 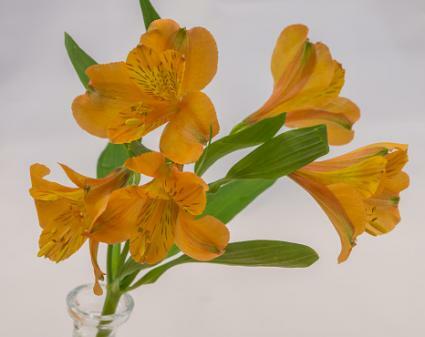 Both types of alstroemeria posses the same basic requirements for proper growth. When grown in their optimal conditions, each type will grace gardens with their attractive blooms for years. Even gardeners without any space in the landscape can grow them in large containers to add a tropical splendor to outdoor porches, balconies, and porches. Light: For best performance and production of blooms, plant in a full-sun to partially shady location. In hot climates, plant in locations receiving some afternoon shade. Soil: Plants grown in the ground and in containers perform best grown in fertile, well-drained soils. Moisture: Once established, both types are drought-tolerant, but regular applications of water to keep the planting site moist but not soggy produce the best growth. Container plants require water when the top inch of soil is dry to the touch. Make sure to apply even moisture to the roots even while the plants are dormant. Container requirements: Use containers with bottom drainage or the plants will rot due to too much moisture. Containers 3- to 5-gallon in size are large enough to hold one to several plants. 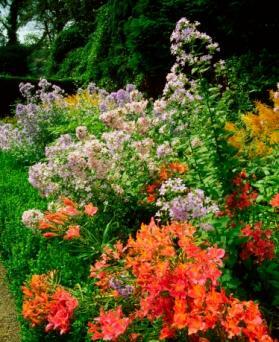 Gardeners have choices in planting alstroemeria transplants or seeds. Transplants are the quickest method of getting flowers though the seeds should also produce plants that bloom within the first year. Spring is the best time to plant transplants into the garden. Select an appropriate growing site and amend the soil with compost or organic matter, making sure the area has proper drainage. Work the organic matter into the soil 6 to 8 inches. Remove the plant from the container, being careful not to disturb the root system too much. Gently spread the roots out over the planting site, being sure to plant no deeper than it was growing inside its container. Cover the root system with soil and firm up around the plant. Water in well, saturating the roots. Space multiple plants according to their mature spread. Spacing too closely reduces air circulation, which can create disease and pest problems. Propagating and planting seeds require a few more steps than planting transplants, with the most important aspect being to sow in fall. Soak the seeds in a container of water for 24-hours before planting and then remove from the water. Scarify the seeds by nicking the dark portion with a knife though this step is optional. Fill seed-starting containers with a one-part perlite or vermiculite and one-part organic matter. Make sure the container drains. Plant each seed 1/4-inch deep into the soil and water well to moisten the soil. Keep the soil moist while the seeds germinate. Place the seeds outdoors, if nighttime temperatures are 40°F and if not, place the seeds inside of the refrigerator. The seeds should spout anywhere from two to six weeks. 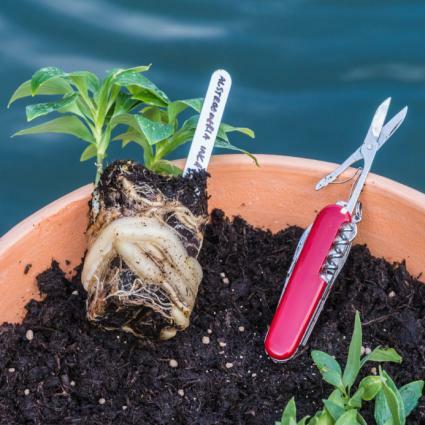 Transplant the seedling into permanent containers or in an appropriate garden location when they are at least 2 inches tall. Pests and diseases rarely bother Peruvian lilies though spider mites can become a problem with plants grown indoors and aphids can attack new growth on outdoor plants. Controlling both pests is as easy as using a strong blast of water to dislodge them from the plants. If grown in soils that are constantly wet and soggy, root rot can develop and kill the plants. Therefore, it's important to grow the alstroemeria in soil that drains well or plant in raised beds to lift the root system out of saturated conditions. Fertilizing: Fertilize during the growing season with a water-soluble, slow-release or organic blend, following label instructions on amounts and frequency. Once the flowers have set on the plant, stop fertilizing until the next season of growth. Pruning: Once the plants have finished blooming for the season, prune the foliage and spent flowers down to the ground. Be sure to use sanitized pruning tools so you don't transfer disease to the plants, which is as easy as wiping the blades off with alcohol. Winter care: In the coldest areas of its growing zones, plants should have a heavy layer of mulch applied on top for protection, especially young plants. The entire root system can be dug and stored in a moist medium indoors, but use caution as the sensitive and brittle root system doesn't take well to transplanting. Bring containers indoors and place in a protected location until the warmer weather of spring. Alstroemeria fulfills many uses in the garden and is a suitable addition to wildlife gardens, as its flowers attract butterflies, bees, and hummingbirds. Its cheery blooms make acceptable additions to woodland gardens, mixed perennial and annual flower gardens, borders or used in mass plantings. Cut flowers last up to several weeks, so the colorful blooms brighten up any location indoors. With its hardy habit, even brown-thumb gardeners will have success with its growth.